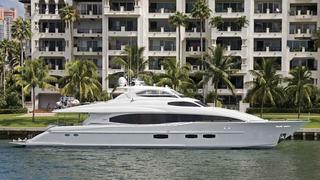 Rich Lazzara at Lazzara Lenton sends word that he's signed the 35.35m motor yacht Serenity for sale. Built by Lazzara in 2008, Serenity had a full programme of service work in September 2012. Her large, elegant saloon is panelled in light maple while the flooring is in golden cherrywood and her dining area comfortably seats 12 guests. Accommodation is for 12 in a master suite and four VIP staterooms, two of which can be reconfigured into a second master. Twin 2000hp MTU engines give her a cruising speed of 22 knots and top speed of 27 knots. Other features include a hydraulic swimming platform and twin transom pods for two personal watercraft. On display at next month's Fort Lauderdale show, Serenity is asking $8,495,000.